While countries across Europe and North America commemorated military casualties of past and present wars on November 11, Israel was targeting civilians. On November 12, waking up to a new week, readers at breakfast were flooded with heart rending accounts of past and current military casualties. There was, however, no or little mention of the fact that the majority of casualties of modern day wars are civilians. There was also hardly any mention on the morning of November 12 of military attacks on Gaza that continued throughout the weekend. A cursory scan confirms this for Canada's CBC, Globe and Mail, Montreal's Gazette, and the Toronto Star. Equally, for the New York Times and for the BBC. Articles that do report on the killings overwhelmingly focus on the killing of Palestinian security personnel. For example, an Associated Press article published in the CBC world news on November 13, entitled 'Israel mulls resuming targeted killings of Gaza militants,' mentions absolutely nothing of civilian deaths and injuries. It portrays the killings as 'targeted assassinations.' The fact that casualties have overwhelmingly been civilians indicates that Israel is not so much engaged in "targeted" killings, as in "collective" killings, thus once again committing the crime of collective punishment. 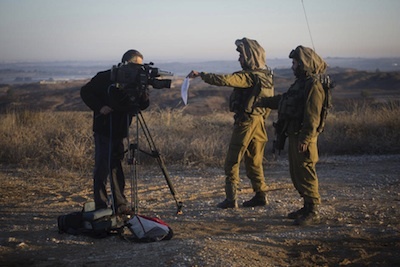 Another AP item on CBC news from November 12 reads 'Gaza rocket fire raises pressure on Israel government.' It features a photo of an Israeli woman gazing on a hole in her living room ceiling. Again, no images, nor mention of the numerous bleeding casualties or corpses in Gaza. Along the same lines, a BBC headline on November 12 reads 'Israel hit by fresh volley of rockets from Gaza.' Similar trends can be illustrated for European mainstream papers. News items overwhelmingly focus on the rockets that have been fired from Gaza, none of which have caused human casualties. What is not in focus are the shellings and bombardments on Gaza, which have resulted in numerous severe and fatal casualties. It doesn't take an expert in media science to understand that what we are facing is at best shoddy and skewed reporting, and at worst willfully dishonest manipulation of the readership. Then, on November 8, a 13-year-old boy playing football in front of his house was killed by fire from the IOF that had moved into Gazan territory with tanks as well as helicopters. The wounding of four Israeli soldiers at the border on November 10 was therefore already part of a chain of events where Gazan civilians had been killed, and not the triggering event. We, the signatories, have recently returned from a visit to the Gaza strip. Some among us are now connected to Palestinians living in Gaza through social media. For two nights in a row Palestinians in Gaza were prevented from sleeping through continued engagement of drones, F16s, and indiscriminate bombings of various targets inside the densely populated Gaza strip. The intent of this is clearly to terrorise the population, successfully so, as we can ascertain from our friends' reports. If it was not for Facebook postings, we would not be aware of the degree of terror felt by ordinary Palestinian civilians in Gaza. This stands in stark contrast to the world's awareness of terrorised and shock-treated Israeli citizens. An extract of a report sent by a Canadian medic who happened to be in Gaza and helped out in Shifa hospital ER over the weekend says: "the wounded were all civilians with multiple puncture wounds from shrapnel: brain injuries, neck injuries, hemo-pneumo thorax, pericardial tamponade, splenic rupture, intestinal perforations, slatted limbs, traumatic amputations. All of this with no monitors, few stethoscopes, one ultrasound machine. .... Many people with serious but non life threatening injuries were sent home to be re-assessed in the morning due to the sheer volume of casualties. The penetrating shrapnel injuries were spooky. Tiny wounds with massive internal injuries. ... There was very little morphine for analgesia." Bias and dishonesty with respect to the oppression of Palestinians is nothing new in Western media and has been widely documented. Nevertheless, Israel continues its crimes against humanity with full acquiescence and financial, military and moral support from our governments, the U.S., Canada and the EU. Netanyahu is currently garnering Western diplomatic support for additional operations in Gaza, which makes us worry that another Cast Lead may be on the horizon. In fact, the very recent events are confirming such an escalation has already begun, as today's death-count climbs. The lack of widespread public outrage at these crimes is a direct consequence of the systematic way in which the facts are withheld and/or of the skewed way these crimes are portrayed. Hagit Borer, Antoine Bustros, Noam Chomsky, David Heap, Stephanie Kelly, Maire Noonan, Philippe Prevost, Verena Stresing, Laurie Tuller.